The course addresses the economic dimensions of sustainable planning and organization of informal urban settlements and seeks to develop strategies to improve the resilience of its underlying economic systems. It is organized as a joint project and mixed group of ESCP Europe students (Master of Sustainable Management) and architectural and urban planning students from the Technical University Berlin. 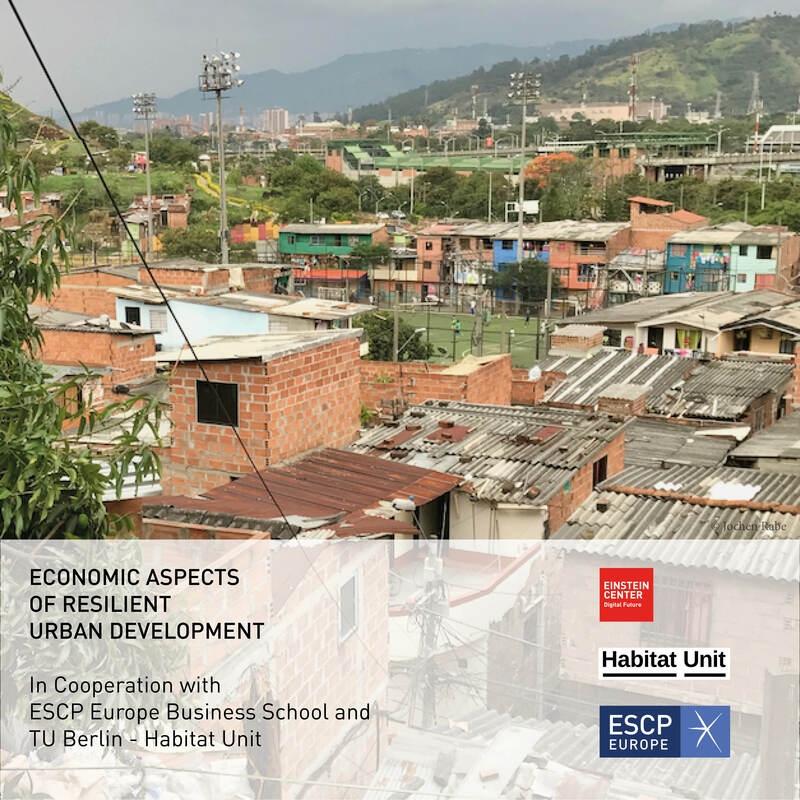 The course will be jointly taught by Prof. Jochen Rabe – Einstein Center Digital Future, Prof. Sylvie Geisendorf – ESCP Europe, based on and as part of the ongoing two semester project “Urban Lab Medellín-Berlin” under the leadership of Prof. Philipp Misselwitz – Habitat Unit TU Berlin. Focus of the cooperation is to analyse the spatial, economic and social systems de ning the community of Moravia in Medellín and to develop a systemic socioeconomic and spatial strategy informing the future of the neighbourhood both at the current location and within a potential future relocation context. The inhabitants of Moravia have established a local recycling business with a high degree of connecting precarious microeconomies and communal cooperation. While the ESCP Europe students shall analyse economic requirements and opportunities to evolve the Moravia recycling economy towards a higher degree of resilience, the architectural students from the TU Berlin are developing ideas for the new infrastructure, buildings and spatial interventions. The analysis shall take into account infrastructural needs for a functioning microeconomy and ideally allow the inhabitants to scale their informal activities to the next level. The students of both the ESCP and the TU are expected to cooperate in interdisciplinary teams in this exciting yet demanding 8-10 weeks cooperation.